This level has easy difficulty. 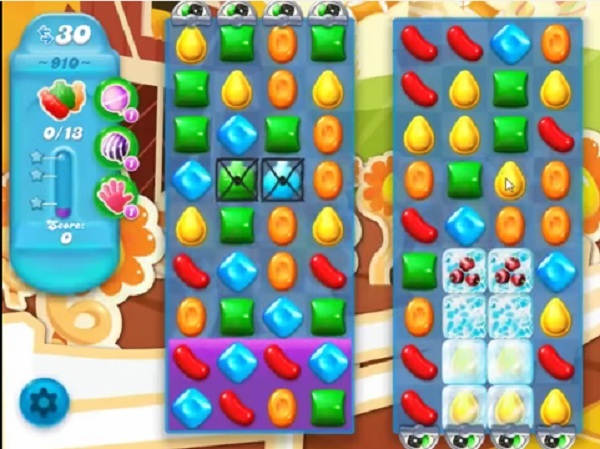 For this level try to play more from where more candies are available to play. Make special candy and combine them with other special candy to break the blockers and soda bottles. EASY???!!! This level stinks!!! I came close ONCE but it didn’t release the bottles until I made my last move. And DON’T use boosters, the fish will just go after the licorice 🙁 MAD >:( !!!!! Wat een slechte vertaling,snap er niks van! King needs to correct this level. You only get 26 moves on phone app or via FB. It states 30. THis is a joke…There are only 26 moves, not 30….Cleared both sides with 5 moves to go,and 6 moves…No bottles to be found..Worst game I’ve seen..They are looking for your money on buying boosters..
Don’t have 30 moves this level is really hard would really Appreciate HELP too many Blockers to clear I will NEVER get this one without help need a LOT of SPECIAL candies THANK you so MUCH I AM STUCK ON THIS ONE HELP PLEASE. Only 26 moves. Give it another go and see about easy difficulty. Why does manage allow their programmers to make a games that takes weeks to play? I have only came close once and as said before the 13th bottle is not release until you are out of moves. This is a terrible game and reflects poorly on the management of Candy Crush. Can’t get anywhere with this level, no more than 7,8 bottles but I only have 26 moves not 30 why is that, it should at least have the correct amount of moves when it’s so hard, had a lot of very hard levels lately so boring.